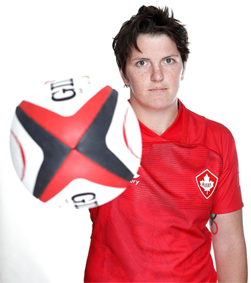 Britt Benn played a starring role in Canada’s silver medal showing in the Dubai Sevens Series this weekend, earning a selection to the rugby tournament’s Dream Team in the process. The Napanee native scored three tries in the tournament, including a key early strike in the semifinals against Australia. The Canadians would need all the offense they could get in that one, scoring on the final play of the game to secure a 15-10 victory. In the finals they were bested by their long time rivals from New Zealand however, falling 26-14 to finish as silver medalists. Benn helped the Canadians get off to a strong start at the tournament, scoring an early second half try to help power a 38-7 victory over Fiji. After a 28-7 win over Spain, the Canadians were matched up against France with a chance to go undefeated in pool play. Benn once again wasted little time getting Canada on the board, scoring her second try of the day en route to a 21-14 Canada victory. In the quarter-finals they topped Ireland 24-7 to advance to the semifinals. The silver finish marked the second time Canada has reached the podium in this year’s HSBC World Sevens Series. In October they placed third in Colorado, USA. Their pair of top three finishes gives them 34 points on the season, good for second overall two trips into the five stop circuit. They trail New Zealand, who has two first place finishes, by six points. Canada leads the US by two points and Australia by six and hold a 12 point advantage over fifth place France. All told 13 teams have earned a point this far. The top four teams at the end of the season will be granted an automatic berth into the 2020 Olympic games, which will be held in Tokyo, Japan. Benn and her Canadian teammates earned bronze at the Rio games in 2016, where rugby sevens made its Olympic debut. The next stop on the sevens series will be Feb. 1-3, in Sydney Australia. It will also include a stop in Kitakyushu, Japan, Langford, Canada and Paris, France in 2019. Along with being named to the Dubai Series Dream Team, it was also announced this week that Benn is one of four players nominated by Rugby Canada as the 2018 Women’s Sevens Player of the Year. Fans can now vote for their choice until Dec. 20 at www.surveymonkey.com/r/playeroftheyear2018.